Nicolò Melli had the best game of his career in Milano, considering the stakes, competition level, consistency throughout the game. He scores 20 with impressive percentage but it’s not only that because he makes his presence felt inside the area and when Zalgiris looked on the verge of going down he scores again twice. When he fouls out he gets a standing ovation, all the fans standing up to cheer. With Gentile injured and stille on the court, Olimpia played a terrific game with some black-outs, both defensively and offensively keeping the team to kill the game in the first half and in the second to control it with no trouble. It’s 82-75 at the end. Consistent game by David Moss, too, excellent Jerrells, Olimpia is growing up. THE FIRST HALF – With Gentile affected by an hip injury, Bruno Cerella is starting to keep the rotation safe. Brunito makes the basket of the first Milano’s lead, 6-5 when the first few possessions are hampered by some missed shots and still Olimpia is able to get many offensive rebounds and stay ahead. When the struggles are finished, Olimpia scores over a seven-possession span, Jerrells scores six points in the period, Melli makes three consecutive shots including a lefty bank shots but the margin is never more than six because Zalgiris goes to the line 10 times and score every single time. The first is over, 25-19 Olimpia. Melli’s fourth basket – steal and then another bank shot after faking a pass to Moss – and a Gentile’s three from the right corner open up the second quarter. EA7 goes up by 11 and still it’s not stopping. It goes up by 16 after a Haynes three. Then for three straight possession it doesn’t score and Zalgiris is good enough to get back down by 12, 39-27 forcing a coach Banchi’s time-out. Olimpia is coming out of the huddle very strong: Melli scores again and Moss makes a shot hook shot. The lead is 16 momentarily because a couple of open threes against Zalgiris zone are not good. At halftime is 43-31 Milano. THE SECOND HALF – Zalgirisis starting strong offensively. Moss scores a long jump but in the first 150 seconds this is all. Coach Banchi calls a time-out after a Justin Dentmon three that shrink the lead to seven, 45-38. Moss scores twice again, Jerrells makes a three and Samuels has the first basket of his game on a Jerrells assist. 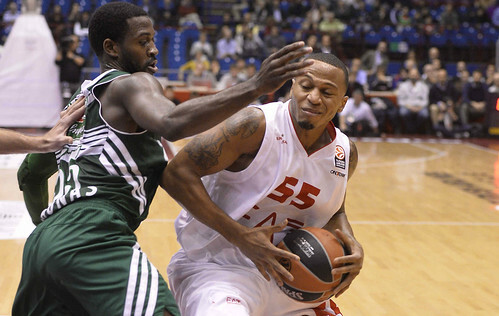 Olimpia is again up by 11, 55-44 but it’s still a difficult period. Kaunas is coming up strong. Martynas Pocius makes a three on an in-bound play and the lead is reduced to three points, 59-56. Haynes responds with another three, Javtokas makes a basket falling down, Chiotti makes one free throw. At the end of the third the lead is four points. The fourth quarter is a battle. Olimpia is in the penalty after a little more than three minutes. Zalgiris is going to the line. Javtokas makes two and it’s 67-65. Langford breaks the run but he makes only one free throw. On the ensuing possession, Melli grabs the reboundd and Moss scores a three from the corner on a Langford assist. EA7 is back up by 6, 71-65. Langford makes another free throw and it’s a seven-point lead. Jerrells makes a huge three and it’s again a double digit lead for Olimpia. Nicolò Melli so can complete his marvelous game scoring twice including a tap-in to get to 20 points. And Olimpia can close the game out.